Paper Cube is an enthusiast photographer based in Kent, UK. He attends all the national comic con conventions up and down the country so you may of had your photo snapped by him! He’s an official MCM Expo event photographer, he even has a T-shirt to prove it, (well he did have). You may of also seen his photos published on the MCM Buzz pages or even in MyM Magazine and NEO magazine! Here are some of his favourite cosplay photos that he personally enjoys. We have linked to Facebook pages or Twitter accounts where possible so if you want to see more from these cosplayers, just try clicking their name! PC: Just want to say thank you to all you cosplayers out there, not just the ones featured here, but also everyone that’s given up their time to shoot with me, whether just a snapshot or a full session, I appreciate the effort and hard work that goes into making your costumes, without you there, the images are nothing. I look forward to shooting with more of you in future and seeing more of your costumes! Lastly, thank you to Need To Consume, Nikkie specifically for the feature, keep up the good work guys! It’s nice sometimes to be able to colour grade a photo to mimic the look and match the series it came from, and in this case the animated movie final fantasy Advent Children. After all, that’s what the cosplayer is trying to achieve. Eileen’s cosplay of Midna was stunning with so much detail. I was lucky enough to bump into her at one of the conventions early on the day, so all her makeup was still fresh and looked perfect. I like the feeling this conveys to anyone who’s seen this part of the cut scene in the game. It’s always good when I spot a cosplayer from a game I play myself, so when I saw Mayo Chans Ivy, I quite literally chased her to get a photo. Although I only had time to do a few snapshots, I really liked how this came out in the end and with some careful editing I replaced the people from the background. I’ve already arranged to shoot her Ivy again on location at some point once she’s in the UK with it, so I’m really looking forward to it. Working with natural light is something you have to get to grips with when shooting at conventions. This shot was done with the use of sunlight that was coming through from the window above. 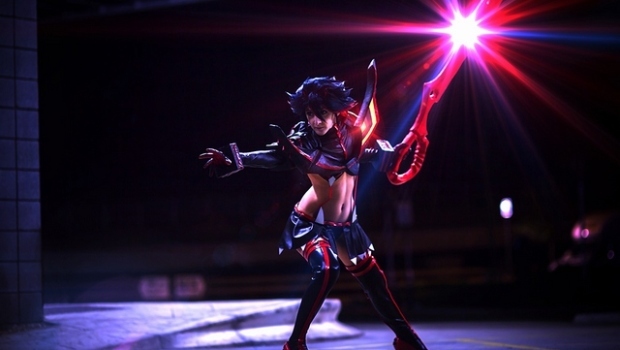 It’s nice to find lighting that can fit in with a cosplayer in some way. Shooting at night although technically more difficult can yield some great results. It was very cold when we did this shoot at the convention, but we managed to get some nice shots, which I’m very happy with, so a big thank you to ChromiumRed Cosplays for her patience and dedication for doing the shoot. This image is done using a tilt shift technique which makes the subjects look like toys, which is perfect for their cosplay. I positioned them where I could stand on a table and angled my shot using a very shallow depth of field to take the shot required for this effect to work. Turning up the saturation higher than usual in Photoshop gives off the diffuse effect plastics have. This was an on location shoot, the only time I can really setup a proper lighting arrangement. This setup consists the use of two flashes, one behind the cosplayer which is red gelled and one on a stand with a shoot through umbrella, just slightly off centre above me to avoid casting unwanted shadow on the cosplayers face through the door frame. I wanted to replicate the idea of executions from the game, except this one is where she’s in a burning classroom and Junko is doing her last signature pose before meeting her demise. This is a custom character based on Jinx from League of Legends by Kyahri. I love her costume because it’s so colourful and adds nice contrast to the overall image, so I really like how this image came out. Finding the perfect backdrop for a cosplay during a convention is very hard to come by, as you’re limited to what’s available around or have to do it in post editing, which can take up a lot of time. So sometimes it’s worth taking the time to venture out of a convention and doing on-location shoot instead. This image almost never saw the light of day as normally I only process a selected few from any shoot I do, and this was one of the photos that wasn’t initially chosen and would have been deleted. I’m now glad I kept this and worked on it in the end as it’s currently being liked by many on my Deviant Art gallery. I like the freeze action in this composite. The two cosplayers in this photo are sisters as well, so a lot of the times they will cosplay from the same series and it is always good laugh shooting with them. I think enjoying the shoot itself is just as important as getting nice photos back. Joey does an amazing Indiana cosplay and his impressions in this photo captures the character very well like in the movie. It’s a skill in itself to find backdrop suitable for the cosplayer, in this case, I placed him in front of some rough looking wall, which served as a good backdrop. In some cases I would do the opposite and look for cosplayers that will suit the environment instead. When I do a shoot I always try and do everything in shot if possible than relying on Photoshop, of course a lot of times that’s not possible due to the nature of the effect needed, or purely because the right equipment isn’t around available at the time of shoot. But in this case the frost smoke is actually real smoke being blown through the mask, and I deliberately placed her in front of a black wall to bring out the effect of the smoke and Mother Nature was on our side by not being overly windy at the time so the smoke didn’t thin out too much. A showcase gallery can’t go without a Harley right? Her character is so versatile and there’s so many variations, so I would never get bored shooting her. I really like how all the colours in this image go together, and of course the mischief looking expression on her face adds to the overall feel of the pose. Alias Cosplay is a very talented cosplayer who put a lot of effort into her costumes, so it’s always a pleasure working with her. Sometimes I feel a photo is best left without too much editing so it can retain the colours that the cosplayer intended to when making the costume. I really enjoy taking photos that tell a story or to re-enact out a scene. This shoot with Ruxtano and The Girl Called Jef went on for over an hour because we was having such a laugh and brainstorming all the different re-enactments, which this photo is only one of many. 300 is one of my top favourite movies, so naturally when I saw this cosplayer I had to take photos of him. I already knew I was going to replace the background with something more suitable when I was doing the shoot on convention grounds. It’s a shame I never found out who this is as I would like to credit him. It was taken at London MCM Comic Con – October 2013. Yaya Han is one of the first cosplayers I was used to seeing before I even started my cosplay photography back in 2013, so it’s amazing for me to be able to meet her in person and take photos of her elaborate costumes. I was also a very big fan of street fighter II myself back when it first came out, so this opportunity to capture this image for me marks a special occasion. I’m a fan of Diablo 3 myself, so I know the characters very well and I can see the details Agota has gone into making and replicating this awesome demon hunter. As an urban explorer myself (someone who goes out of their way to take photos of derelict buildings and structures) I knew the place which would have a perfect backdrop for it, so after taking a few photos of her cosplay at the convention, I revisited one of these derelict areas and using the same angle of view, I took the necessary photos I needed and used it to compile this composite. This is another photo which originally had a lot of people in the background as it was taken inside one of the halls as Kelly couldn’t leave the area her table was at. The additional hair which I later added to reinforce movement was quite challenging for me, but I managed to get it looking how I want it and I’m happy with the result. It’s always good to challenge yourself, that way it keeps things interesting and you learn new techniques at the same time which can be rewarding. One of the best times to take a photo outdoors is when the sun is set to raise very early in the morning, or in this case before it sets in the late afternoon. In the photography scene this is known as the golden hour, and for good reason. I’m glad I managed to find Mirimews Nidalee the second time round she wore this cosplay. I like the pose she has there and the surrounding colour matching her costume. This is Stephanie’s first time at a convention wearing a costume and of course her first photo shoot she’s done. It’s always nice discovering new cosplayers and I’m glad so many members of the public are now embracing the geek and cosplay culture.